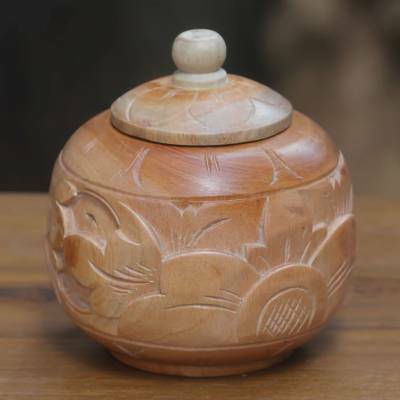 Decorative mahogany wood jar, "Bali Bougainvillea II"
Crafted from rich mahogany wood with a natural finish, this petite lidded jar is presented by Bali artisan Sarwaedi. The self-taught artisan crafts the vessel by hand, embellishing the surface with florid bougainvillea blossoms. 11.5 cm H x 10.5 cm Diam. 4.5" H x 4.1" Diam. Sarwaedi has received a $1200 microcredit loan with 0% interest. "'My children should have a better life then mine before.' Whispering this sentence always builds my spirit." "I was born in Sukawati, Gianyar in Bali on April 21 1970. It seemed natural to join Novica, as my brother, Made Wirata, is a wood carver and my wife, Made Mulyani, crafts masks, and both of them are Novica-featured artisans. In the town where I grew up, most people are wood carvers, and so was my family. "People know me as a humorist, a simple and fully responsibility man. From the time I was in fourth grade, I worked and paid my own tuition. I learned wood sculpture by watching my parents. In those days, children began learning the art at a young age and I was not alone. I had many kinship friends that time. "By the time I was in senior high school, I was always paying my tuition very late and my parents couldn't help me because they didn't have the economic means to do so. At the same time, I wasn't getting any orders for my wood carvings. I was so ashamed of my impoverished condition. But going through all of this strengthened my spirit and determination about my own future. I knew I wanted to have a happy family and raise my children in better conditions than I had. "Finally, I graduated from high school and married the woman who is now my wife. We have two children — a boy and a girl — who are currently in high school. 'My children should have a better life then mine before.' Whispering this sentence always builds my spirit." "Today, I continue working with wood, but I'm focusing on making vases and classic boxes. I enjoy using the lathe, then carving the objects with manual tools such as chisels, hand-saws and mallets. I give unique finishes to my designs to distinguish them from the others. I believe mahogany is perfect for these designs — it's easy to find and good for the lathe and for carving. "I'm very excited about showing my designs worldwide through Novica, and I hope my dreams and goals for my children will come true." Mr. Sarwaedi, I have purchased 2 of your beautiful wood carvings and I love, love them. I collect angels, therefore, I fell in love with your angel wall hanging. My other piece is one of your decorative wood boxes which has lovely floral carvings . Both are welcome additions to my home.